WASHINGTON, Oct. 2, 2014—Commercial devices capable of encrypting information in unbreakable codes exist today, thanks to recent quantum optics advances, especially the generation of photon pairs—tiny entangled particles of light. Now, an international team of researchers led by professor Roberto Morandotti of INRS-EMT in Canada, is introducing a new method to achieve a different type of photon pair source that fits into the tiny space of a computer chip. The team’s method, which generates “mixed up” photon pairs from devices that are less than one square millimeter in area, could form the core of the next-generation of quantum optical communication and computing technology. The research will be presented at The Optical Society's (OSA) 98th Annual Meeting, Frontiers in Optics, being held Oct. 19-23 in Tucson, Arizona, USA. 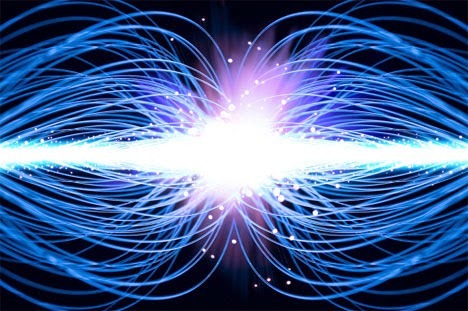 One of the properties of light exploited within quantum optics is “photon polarization,” which is essentially the direction in which the electric field associated with the photon oscillates. The research team set out to find a way to directly “mix up,” or cross-polarize, the photons via a nonlinear optical process on a chip. Cross-polarized pump photons (red and blue) interact in the micro-ring resonator to directly generate cross-polarized correlated photons (green and yellow). Credit: Lucia Caspani. which entanglement can be achieved by accurately mixing these states. Now, we have found a way to directly generate cross-polarized photon pairs,” says Lucia Caspani, a postdoctoral fellow at INRS-EMT and co-author of the Frontiers in Optics paper. To generate the cross-polarized photons, Caspani and colleagues used two different laser beams at different wavelengths —one vertically polarized and another horizontally polarized. The approach, however, came with a potential pitfall: the classical process between the two pump beams could destroy the photons’ fragile quantum state. To address this challenge, the team, which also includes researchers from RMIT University in Australia and City University of Hong Kong, pioneered a new approach based on a micro-ring resonator—a tiny optical cavity with a diameter on the order of tens to hundreds of micrometers—that operates in such a way that energy conservation constraints suppress classical effects while amplifying quantum processes. While a similar suppression of classical effects has been observed in gas vapors and complex micro-structured fibers, this is the first time it has been reported on a chip, thus opening a clear route for building scalable integrated devices. The fabrication process of the chip is also compatible with that currently used for electronic chips. “It enables a future coexistence of our device with standard integrated circuits,” says Caspani, which is a fundamental requirement for the widespread adoption of optical quantum technologies. Presentation FTu2A.2, “Direct Generation of Orthogonally Polarized Photon Pairs via Spontaneous Non-Degenerate FWM on a Chip,” takes place Tuesday, Oct. 21 at 11 a.m. MST at the Arizona Ballroom, Salon 8 at the JW Marriott Tucson Starr Pass Resort in Tucson. PRESS REGISTRATION: A press room for credentialed press and analysts will be located in the Marriott, Sunday through Thursday, Oct. 19-23. Those interested in obtaining a press badge for FiO should contact OSA's Lyndsay Meyer at 202.416.1435 or lmeyer@osa.org. Frontiers in Optics (FiO) 2014 is The Optical Society’s (OSA) 98th Annual Meeting and is being held together with Laser Science, the 30th annual meeting of the American Physical Society (APS) Division of Laser Science (DLS). The two meetings unite the OSA and APS communities for five days of quality, cutting-edge presentations, fascinating invited speakers and a variety of special events spanning a broad range of topics in optics and photonics—the science of light—across the disciplines of physics, biology and chemistry. An exhibit floor featuring leading optics companies will further enhance the meeting. Article published in : http://www.osa.org.